Our battles take place twice a month: on the 1st and 15th. The results come six days later: on the 7th and 21st. That's when I return, total all of the votes, maybe even mine (and it CAN happen - did you check out last battle? ), and announce the winner. First up, let's hear from a few guys who have been around the block, Christian music-wise: The Newsboys. Lead singer Michael Tait came to the group by way of DC Talk. Jesus Freak, anyone? Remember that song? A fellow by the name of TobyMac as a former bandmate, too. But the group traces its roots back to 1985 when they formed "down under" in Australia. Next up: Kari Jobe! Kari hasn't been around nearly as long, coming to the spotlight for this very song when she sang it at the Christ for the Nations Institute in 2004. Her first album followed in 2009 and snagged her a Dove Award. a much better job than I ever will, ha ha. I've never heard these songs before, but both contenders had good voices. Kari Jobe seemed to put more of herself into the song though and gave it more "drama". She gets my vote. Thanks, Debbie - a vote for KARI! She does go all in on this song and I love that, too. Hey, our band plays that song! Definitely Kari Jobe. That song is best with a female voice. Alex, you must have an awesome band! A vote for KARI!! Karl Jobe floats my boat on that one. Hey, girl, the last thing I want to do is sink your boat. A vote for float...er, KARI!! Love this song and you've given a tough choice. However, I'm a bit skewed with this Battle since lately I've been on a Newsboys fix and I really like their sound. I have several Newsboys CD's but have had a renewed interest since watching the "God Is Not Dead" movies. I've had versions of the videos for "Forever Reign" by the Newsboys on rotation on my YouTube listening and was planning to use it in an upcoming Battle someday. What a great song it is! But back to "Revelation Song"--Kari's version is great and I really like the sound of the back-up band. However I've got to go with the Newsboys--this is a very dynamic powerful version. The Newsboys are a powerhouse in Christian music right now. There's a whole lot to love with them. Thanks, Lee - a vote for NEWSBOYS! This hard I like both but I have to vote for Newsboy. NEWSBOYS, it is! Thanks, parsnip! You're no second class carrot to me, girl. My vote goes to Kari Jobe. Thanks, Mary! KARI gets your vote! Wow, Kari really pours her heart out on that one. Give my vote to her! Thank you, m'dears! Great song, eh? A vote for KARI. KARI gets the Fran vote! That should count double, right? Thanks! I liked them both, so I'll go with Newsboys just to keep it competitive. Ha ha ha...I like an underdog in a fight, too, Elizabeth. A vote for NEWSBOYS! Thanks! Well, looking at it one way, it ain't up to me to judge, since worship is a one-on-one heart thing. But in the sense intended, I have to follow the majority for Kari. A vote for KARI and a thank you for Chris! I preferred The Newsboys on this. Kari was a little too breathy for me. Sometimes, that is irritating (though I like both of these...kinda my thing that I never use a song I hate). Thanks, John! Ha! Nice intro, DOC CHERDO, my Sis in the SON. I like 'em "Lord, It's The Battle Of The Bands". I like 'em songs about Papa REAL. Her version had more textures to it, musically. Both were powerful recordings though. 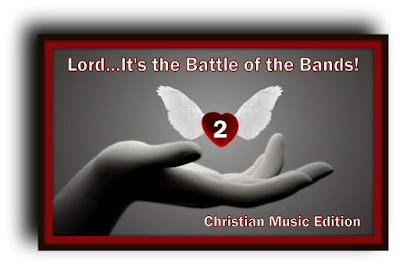 For my December 1st Battle, I too will be dipping into the Gospel genre for a BOTB with a Twist. I think it'll be my 3rd Gospel-themed Battle, and I'm really looking forward to it. Be there or be... bringin' a note from your Mother. We're neck n' neck on the Christian themed battles, I think...this is the second or third one I've done and I'm thinking of making one of mine Christian themed each month. Thoughts? Comments? Warnings? Prophecy, ha ha? Can't wait for Dec! A vote for KARI, it is, brudder! One a month? I'm all for it! This is an odd one for me. The reason, I typically like female vocalists more. Yes, I know I've probably mentioned this several times by now. But for this song, I prefer the Newsboy vocals. Don't get me wrong, Kari did a great job, I just don't prefer it. Please give my vote to Newsboys. Nothing odd about personal preference and this is American, Jeffrey! The land of personal preference voiced and celebrated, so crack open the champagne and I'm gonna give that vote to the NEWSBOYS! oh my!!! This is a wonderful challenge. So hard to decide because i really love both of the performers but i think i'm going with the Newsboys. He Reigns by the Newsboys was my very first christian song i bought on itunes many years ago,which then led to over a hundred now. kari Jobe has a voice of an angel though. Thank you, sweet friend, it's good to see you! He Reigns was a GREAT tune and they've got a whole lot more in their catalog, for sure. Oh I really like the Newsboys version! Kari's is definitely good too but the Newsboys really moved me. Love their sound. Thanks,Michele!! They do a great job on this one, I agree. I love this song. Not sure you can sing it wrong or bad! I prefer The Newsboys in this battle, but Kari Jobe also sang it beautifully. NEWSBOYS, it is! This will turn out to be closer than I thought! Take care, Robin and thanks! i give it to The NewsBoys because it kept my attention. kari sang it well but I was drifting away because her voice just doesn't sound all that distinctive to me. Yeah, I spent too much time at work yesterday, ha ha. I'm working ahead to allow me to take Thanksgiving off.